Back cover: "What was a woman like Brooke Kennedy doing running a guest lodge alone in the Montana wilderness? And why was her best friend so worried about her? Those were the questions Code Nash asked himself after agreeing to cancel his tropical vacation to go on a mission of mercy into blizzard country. For the strong and self-assured woman he found didn't need or want his help--but she was in trouble. Brooke had isolated herself from the world for reasons she wouldn't or couldn't say. But Cody didn't need to be a psychic to sense that Brooke was afraid. Even more, her fear had intensified from the moment he arrived. Now, as the dangerous storm strands them together, Cody must learn the well-guarded secret of this beautiful, gift woman--if he can convince her to give him the one thing he needs to save her from a self-imposed exile: her trust." 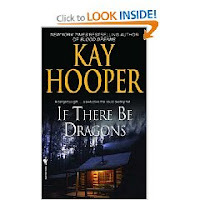 Sometimes you need something easy and light to read and "If There Be Dragons" was just that - a simple romance but with a twist. The main character, Brooke Kennedy is psychic and she can read minds. Something is out there in the wilderness calling her mind to mind and wants her help. Something not quite human and she is scared. Brooke's best friend, with matchmaking on her mind, sends Cody out to help her. Cody falls in love immediately with Brooke and sets out to be her prince and slay all her dragons. Figurative dragons - the dragons on life, the past that haunts Brooke and keeps her isolated in the wilderness. He helps her to face what is calling her, from out in the wildnerness and conquer her fear. It is a fast, interesting read and the quick, witty conversations between Brooke and Cody are humorous. This is the first time I ever read anything by Kay Hooper and it was an interesting introduction to her writing. I discovered this was a light story out of the majority of the 60 books she has written. I don't quite remember what drew me to this book, but glad I've discovered her. She has written a series of paranormal romantic thrillers and first up on on the wishlist for a later time is Stealing Shadows (#1 Shadows Trilogy) According to Booklist, it is the beginning of a "Thrill-ogy" of suspense novels.